SPECIALTY: Custom Builder – New Home Construction & Residential Remodeling. AWARDS: 2009 Chamber Small Business of the Year Award, 2012 Best Home Remodeling Contractor. PROFESSIONAL MEMBERSHIPS: AIA Fort Worth – Allied Member. BUSINESS MOTTO: To keep projects on schedule and within budget, all in an atmosphere of honesty, integrity and the highest ethical standards in the business. ADVICE: Form a collaborative team and utilize online websites like Pinterest and Houzz to collect and share your inspiration. 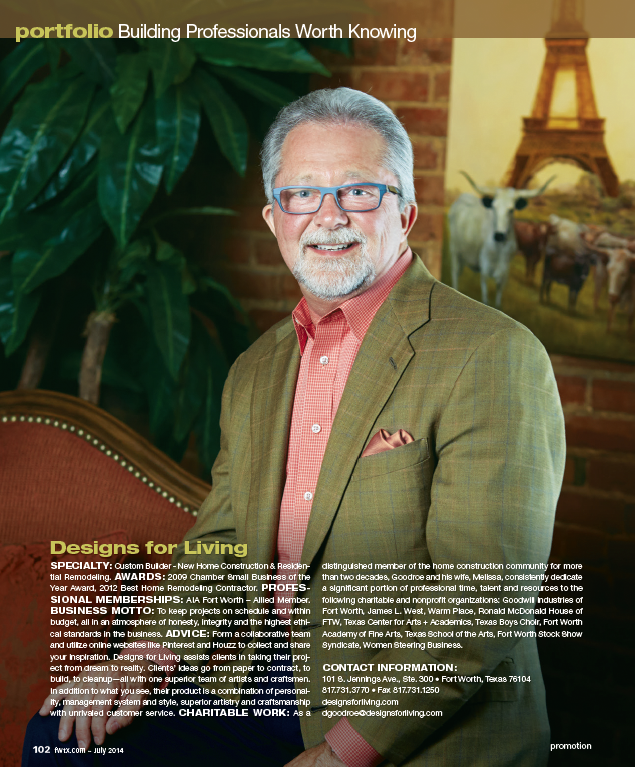 Designs for Living assists clients in taking their project from dream to reality. Clients’ ideas go from paper to contract, to build, to cleanup—all with one superior team of artists and craftsmen. In addition to what you see, their product is a combination of personality, management system and style, superior artistry and craftsmanship with unrivaled customer service. CHARITABLE WORK: As a distinguished member of the home construction community for more than two decades, Goodroe and his wife, Melissa, consistently dedicate a significant portion of professional time, talent and resources to the following charitable and nonprofit organizations: Goodwill Industries of Fort Worth, James L. West, Warm Place, Ronald McDonald House of FTW, Texas Center for Arts + Academics, Texas Boys Choir, Fort Worth Academy of Fine Arts, Texas School of the Arts, Fort Worth Stock Show Syndicate, Women Steering Business.